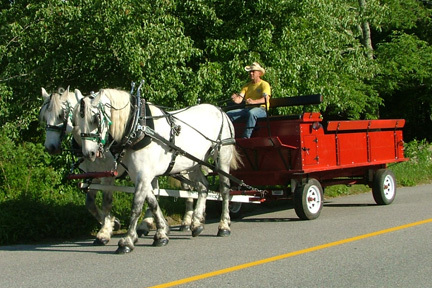 We have numerous, well-cared for carriages, wagons and other equipment to suit your every need. Call us and we will be happy to discuss what may work best for your occassion. 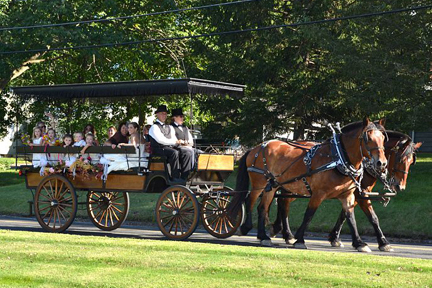 Shown below are some of our most popular horse-drawn conveyences. Photo credit above: Stacy Smith Studios (see our LINKS page for prefered vendors). Our white vis-a-vis has a plush hunter green interior and dark green pin striping. This lovely carriage seats up to 4 adult passengers comfortably, and may be pulled by a single horse, or a pair. Equipped with lanterns and running lights. Use with top down, or up and with storm curtains in questionable weather. Visit our WEDDINGS page for more pictures. Shown at left with top down. Shown at left with full set of storm curtains. 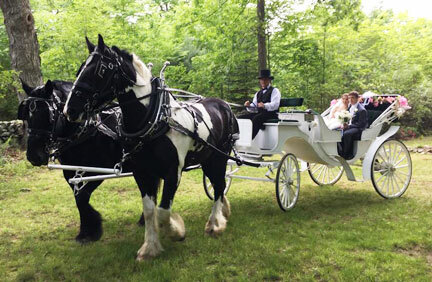 Black with plush silvery-sage interior and intricate silver pin striping, this is our quintessential wedding carriage. May be pulled by one horse or two. Seats 4 adult passengers comfortably. It has electric carriage lanterns and running lights, and full storm curtains for inclement weather. 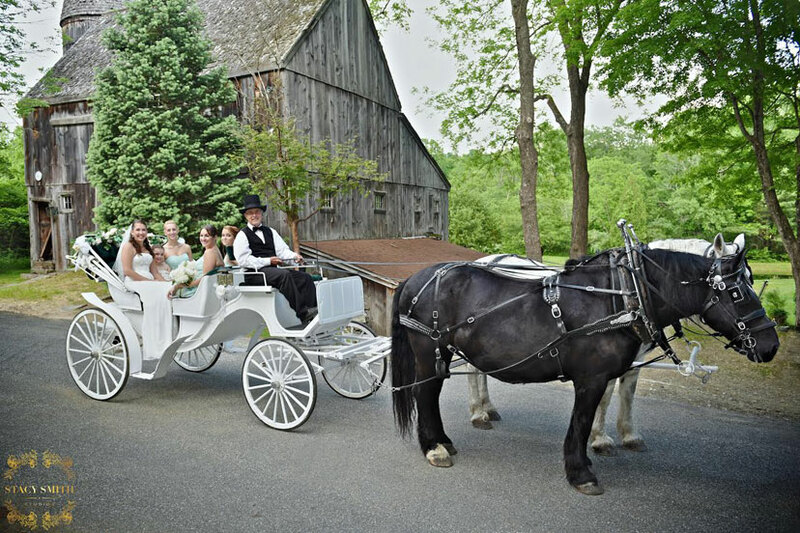 Visit this EOnline link for a celebrity wedding with our black carriage and Diesel. Shown at left with storm curtains. 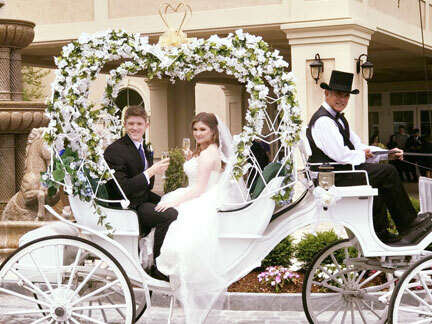 Our Cinderellla Carriage offers the bride or birthday girl the ride of her dreams! 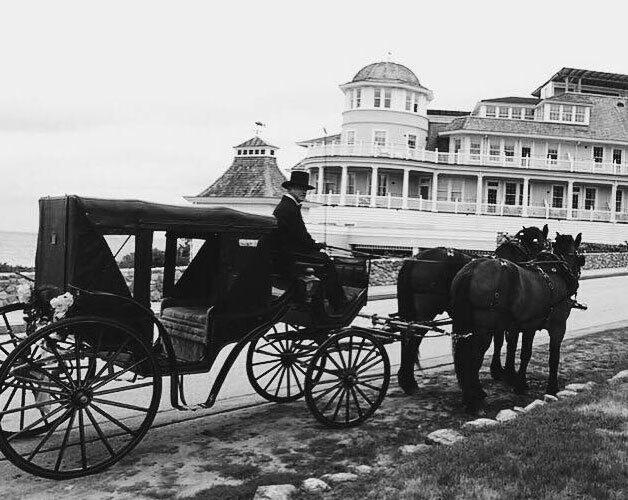 White exterior carriage, equipped with running lights and lanterns, and a wrought iron top embelished with hearts. Oppulently decorated with white silk flowers, with accents in your event colors. A heart "crown" adorns the top. May be pulled by one horse or two. Visit our WEDDINGS or QUINCEANNERA page for more pictures. Black with walnut panels, this is one of our most popular vehicles for large wedding parties, community events and Quinceanera, as well as less formal carriage rides. Accommodates 12-14 passengers, and may be pulled by one horse or two (job and terrain dependant). 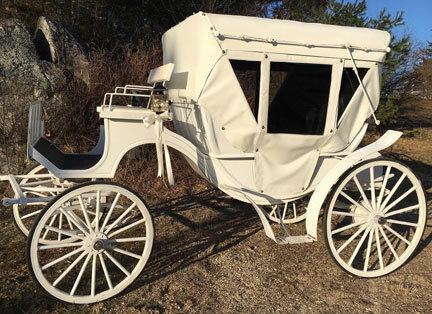 This carriage comes with a fringed surrey top and may be used with storm curtains in inclement weather. Visit our WEDDINGS page for more descriptions. 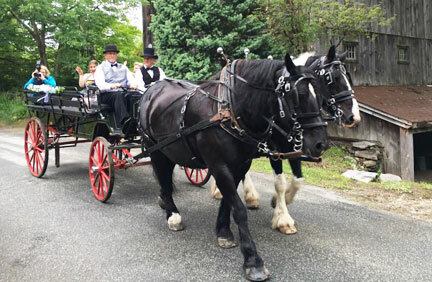 Traditional dark green carriage with red wheels, this exceptional wagonette is one of our most popular carriages for country weddings and community events, as well as informal carriage rides and funerals. 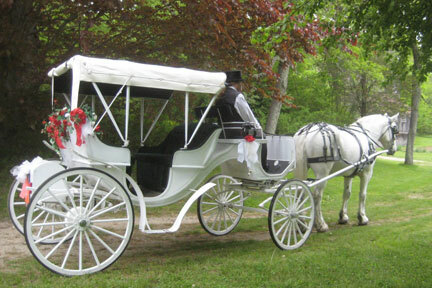 This carriage is available with front and back lanterns for night use. Accommodates up to 12 passengers. Pulled by a team of horses only. This Hay Ride Wagon seats approximately 14-18 passengers on bench seats. Pulled by a team of horses only. Perfect for community and school events, private family and neighborhood rides...you name it! This wagon loads from the back and comes with running lights for safety during night rides. 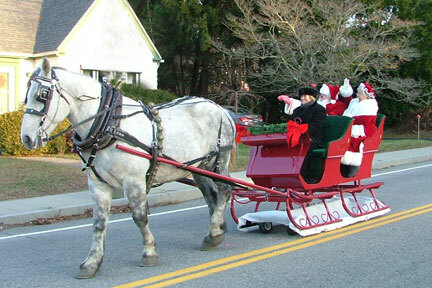 This versatile sleigh is the perfect "Santa's Sleigh" in Christmas colors of red & green! May be used on the road with wheels for a "snowless" ride (shown), or on runners in the snow for a true winter's sleigh ride. Accomodates 2-3 passengers. Be sure to book this vehicle early for your holiday event! 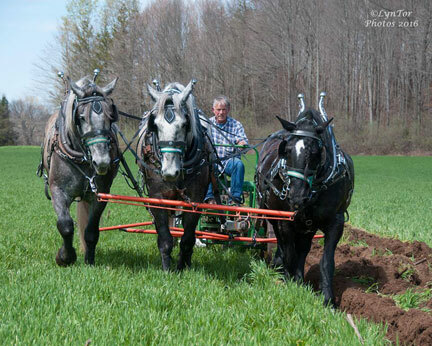 We offer our horse drawn services and expertise for plowing, disc harrowing, and logging. We regularly prepare fields for community gardens, privately owned organic gardens, as well as museum settings in conjunction with demonstrations. We have quite a collection of horse drawn implements, both "modern" and antique. Also available for filming. Call us for more information. Photo credit: Tory MacDonald - LynTor Photos.